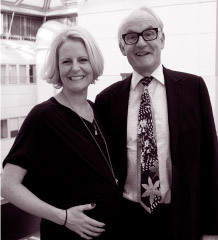 Roger Marwood is a Consultant Obstetrician and Gynaecologist at the Chelsea and Westminster Hospital in London. He has 40 years experience working in busy NHS and Private hospitals and has personally supervised around 20,000 pregnancies. Rebecca Maberly is his eldest daughter who gave birth to her first child last year and is currently pregnant with her second. Together they have founded The Doctor and Daughter’s Guide to Pregnancy which is a must-visit for prospective parents seeking a definitive source of realistic information, free from unqualified input from forums and comments. It enables mothers-to-be make informed decisions throughout their pregnancy, such as whether or not they should be drinking alcohol, running a marathon or eating smoked salmon. Let’s Celebrate Our Great British Businesses!